A thoughtful presentation makes cutting the cake a high point of the wedding reception. 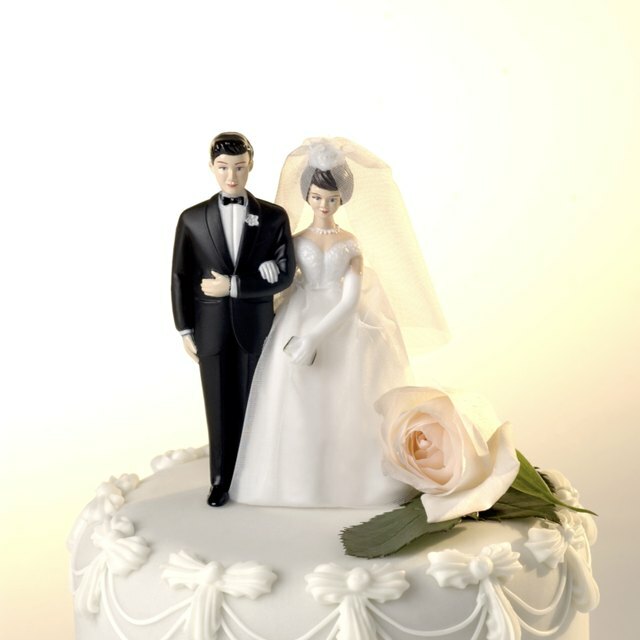 A wedding cake may be the most elaborate dessert a couple ever purchases or serves. Cutting and serving the cake is a traditional act of hospitality during which the new couple includes all invited guests. To honor the newlyweds, their guests and the occasion, proper presentation of the wedding cake is an important element on this special day. Pay particular attention to reception-space lighting. Choose a location where your cake will be well-lit but not under the frosting-melting heat of strong spotlights. Gauge the possibility of melting by putting a frosted bakery cupcake at the distance your cake will stand from the lights. If the overall ambient room lighting is diffuse or dim, add hurricane-shaded candles or other light sources about a foot from the cake. Natural light presents hazards as well. Direct sun can get hot, and even diffused light can present problems. Avoid placing a wedding cake in front of a light-filled window, because this can create a silhouette effect that lets guest see only the outline of the cake. Some multipurpose reception venues offer a neutral background to maximize a sense of space and light and accommodate as many decorating styles and colors as possible. This can mean that your pale-colored cake will sit in front of a white or very pale pastel wall. If you cannot choose a wall that provides a contrast to the color of your cake -- making decorative details of the cake more visible -- explore the possibilities of hanging a drape behind the cake table. Choose a color from your overall decor scheme. A colored table-skirt under a white tablecloth is another way to enhance cake-table visibility. The art of presenting a wedding cake involves making it highly visible without creating an obstacle for guests. Although the cake appears at the end of the meal, it does not have to be put out of view until it is time to cut it. A well-lit alcove or corner in the entryway or main reception room lets the cake shine -- without obstructing flow or being accidentally bumped by guests. If guests are seated for a meal, place the cake table anywhere that guests can see it cut by turning in their chairs. Be aware of air currents when choosing a location, to avoid possible damage from drafts. When planning floor space around the cake table, allow room for the bride's dress. Tradition places the wedding cake on its own table, which is covered with a white cloth. Any additional table decorations, like candles or flowers, are small or low, to give full view to the cake. Echo the candles and flowers on other tables with low tea lights and a scattering of flower petals. Choose table in white or in colors of the wedding decor. A cake table might be skirted, for example, in an accent color from the flowers, keeping it within the bounds of the overall decor palette but setting it apart from guest tables. Keep the cake table small, if possible, so the cake looms as the centerpiece. If the cake must sit on a larger multi-use table, place low flower arrangements or other decorations to create a defined cake-cutting space.